Deontay Wilder became the first American heavyweight world champion since 2006 after taking the WBC title off Bermane Stiverne on points. Wilder, 29, dominated against his 36-year-old Canadian rival, with the three judges scoring the bout 118-109, 119-108 and 120-107 in his favour. The win was the first time Wilder had not won by knockout as he extended his unbeaten record to 33-0. “I answered a lot of questions tonight,” said Wilder. “I already knew I could go 12 hard rounds and take a punch. I am just excited,” he added. Ukraine’s Wladimir Klitschko holds the WBA, IBF and WBO titles. Wilder had not gone past the fourth round in any of his previous fights, but he constantly outpunched a lacklustre Stiverne in Las Vegas on Saturday. “I want to bring excitement back to the heavyweight division,” said the American, who won an Olympic bronze at the Beijing Olympics and knocked out Britain’s Audley Harrison in one round in 2013. After Boston’s John L Sullivan became the first gloved champion in 1885, the heavyweight division was dominated by American fighters for more than 100 years. However, the last American to own a portion of the world heavyweight crown was Shannon Briggs, who briefly held the WBO title. 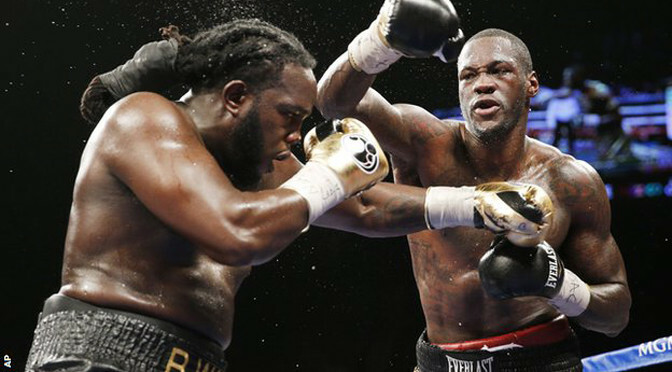 Stiverne suffered his second defeat from 26 pro fights. “It just feels like I was flat in the ring,” he said. “I didn’t do what I know I can do. I need to go back and work on the mistakes.